Some of the rarest, most striking automobiles will descend on Fort Lauderdale for the first annual Exotics on Las Olas (EOL) this fall. Put together with the inaugural Florida Exotic Car Weekend. 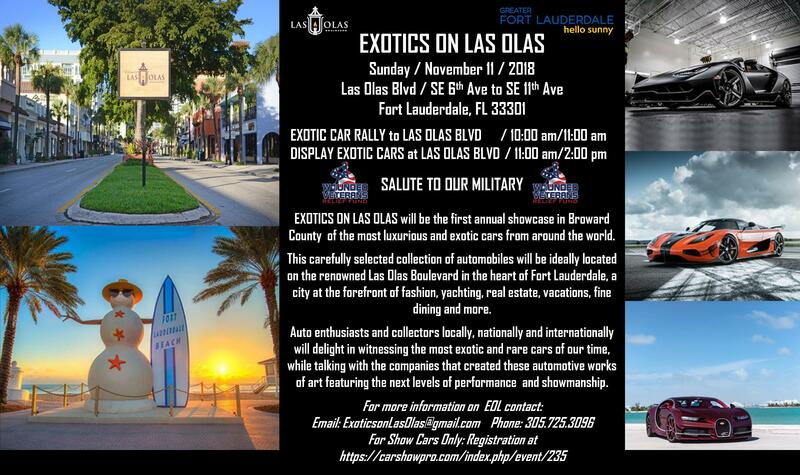 Calling all South Florida auto enthusiasts to rev their engines and save the date for the first annual Exotics on Las Olas (EOL)—Broward County’s first-ever event showcase of some of the rarest, most luxurious, and coveted automobiles from around the world taking place Sunday, November 11, 2018 from 11am to 2pm, featuring a highly-select, carefully-curated collection of vehicles on stunning display along Fort Lauderdale’s renowned Las Olas Boulevard. The event is being produced in coordination with the inaugural Florida Exotic Car Weekend presented by the Greater Fort Lauderdale Convention & Visitors Bureau (GFLCVB). Being held in conjunction with Veteran’s Day, it will include a salute to our veterans with a portion of event proceeds benefiting the Wounded Warriors Project—a 501 (c)3 nonprofit organization that offers a variety of programs, services, and events for wounded veterans of the military actions following September 11, 2001. In partnership with the producers of EOL and the Las Olas Association, this two-day event kicks off Nov. 10 with a packed lineup of all-things-automotive and will culminate with EOL on Nov. 11 for what is sure to be a thrilling grand finale to the weekend-long festivities. Auto enthusiasts locally, nationally and from across the globe will convene along famed Las Olas Boulevard and delight in the opportunity to get up-close-and-personal with some of the rarest exotics and customs on the market and be able to interact with the companies and individuals that have created awe-inspiring automotive-works-of-art on display—leading innovators in the field who are pushing auto artisanship to the next level and highest echelon of showmanship and performance. 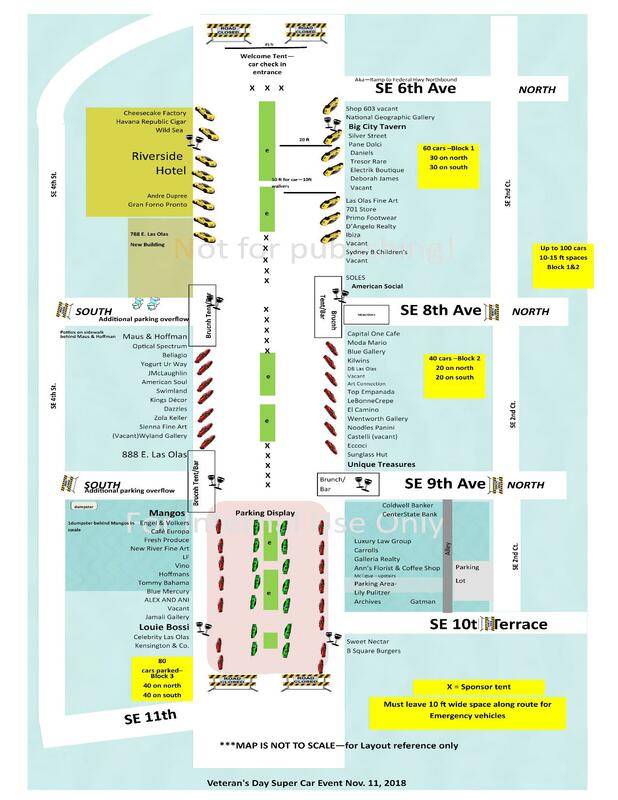 The first annual Exotics on Las Olas (EOL) is free to attend and open to the public with the automotive showcase spanning from SE 6th Avenue to SE 11th Avenue on Las Olas Boulevard in the heart of downtown Fort Lauderdale. A variety of participation and sponsorship opportunities are available for the inaugural event, and further information including VIP attendee and sponsor package pricing and a complete lineup of the various Florida Exotic Car Weekend events to be released in the coming weeks. For registration, display and sponsorship inquiries visit exoticsonlasolas.com or email Floyd Rag exoticsonlas(at)gmail.com. Follow @exoticsonlasolas on Facebook, Likedin, and Instagram for event updates and announcements.